Automate your stretch wrapping process for safety and productivity. 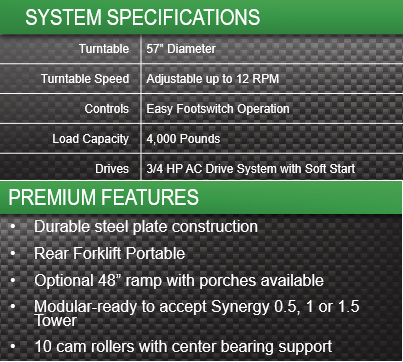 Reliable, rugged turntables rotate loads up to 4000 lbs., allowing operator to wrap from a standing position. Safe soft-start 120V motor operates easily with foot pedal at speeds up to 12 RPM. 20 Amp. This low profile model has a 65" diameter turntable, accessible from pallet jacks, especially when used with the 48" loading ramp. Low Profile Turntable 57" diameter: 57" diameter turntable operates on a 10 cam roller system with center bearing support. Standard Ramp: Allows for easy loading for hand pallet jacks. Ramp Porch Extensions: Ramp porches are typically used when electric powered pallet movers load / unload the turntable, eliminating the leg (fork) of the mover from wedging under the pallet while descending down the ramp.